High strength adhesive that bonds on contact. No need for clamping or special support while the adhesive sets. Multi-purpose - the ideal adhesive for emergency repairs. Bonds most materials even non-porous e.g metals. 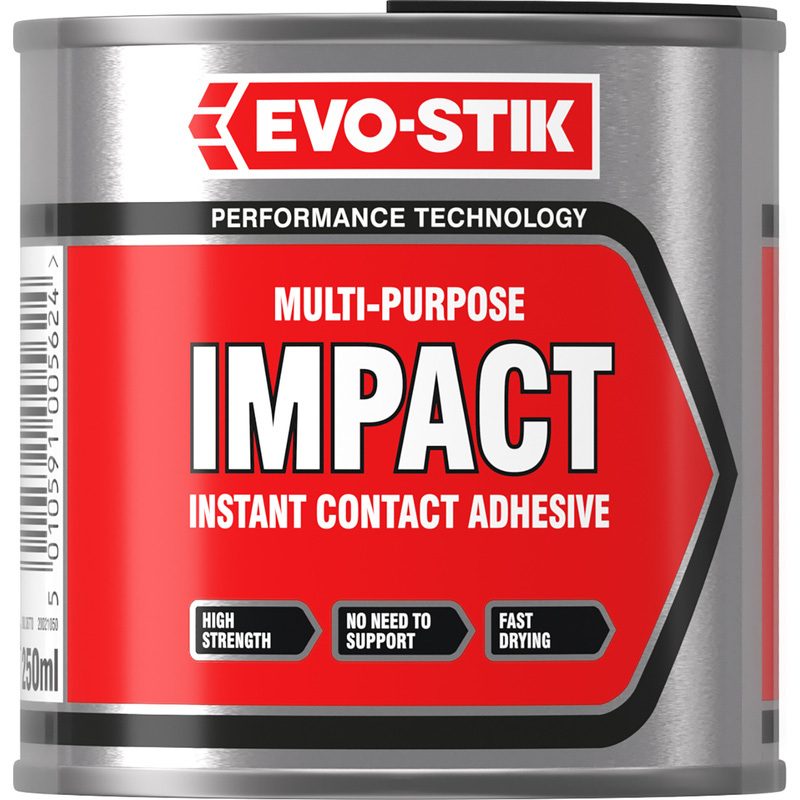 Evo Stik Contact Adhesive 250ml is rated 4.5 out of 5 by 21. Rated 1 out of 5 by LondonStephen from Useless I had been using tuskbond to fix soundproofing and needed some more glue. Bought this and it was useless. Wasted 3 canisters and couldn’t even get it to hold let alone be safe. Rated 5 out of 5 by Hanzon from Works well Used this for sticking rubber to rubber and it worked fine. Have also used for sticking laminate to ply. Important to spread thinly,especially with laminate. Rated 1 out of 5 by Cambridge from Not fit for job I wish I would have got different make. Rated 5 out of 5 by unwaith from simply the best I use this to fix laminate edging strips to worktops, and this is the best adhesive for the job, a great instant grab that works every time. Rated 4 out of 5 by scratchersam from Excellent impact glue This product i've used for years now but don't be fooled by the picture, the picture in the catalogue shows a 500ml can but you only get a 250ml can, that's false advertising. Rated 4 out of 5 by Benny from Great for small areas I use this for fixing edging veneer onto board edges. Dries quickly with reasonable bond strength when you close the joint, but being a contact adhesive you only get one go to assemble the parts. Not sure I would use it for a large area. Given those limitations it works well.